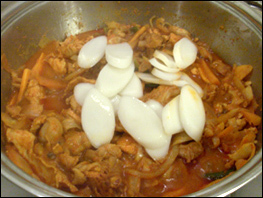 Dak Galbi is a spicy chicken dish originating from the city of Chuncheon, hence the name for my recipe Chuncheon Dak Galbi. It has little or no resemblance to Galbi which generally refers to short pork or beef ribs cooked on a Korean Barbecue, it is however hot spicy fried chicken dish that began in small pubs on the outskirts of Chuncheon, It quickly spread to the central districts and was a popular food for Koreans whilst drinking. It is now widespread and popular throughout South Korea and this recipe is pretty close to the original which began in the 1960s. Chuncheon is the capital of Gangwon Province, The city lies in the northeast of the country, located in a basin formed by the Soyang River and Han River. The area is renowned for its small river islands, and is now a popular destination among tourists as it was featured in the popular Korean drama Winter Sonata. To begin making this dish cut all the vegetables in to strips, almost shredded. These should be about 3 centimeters long and the spring onion sliced, put all of this in a bowl, the chicken needs to be cut in to chunks. I cut all the meat away from the bone as best as possible, discard the bones and cut the breast in to nice size pieces. In a bowl put all the ingredients for the sauce, mix this well and then add this to the chicken and vegetables. Mix this all together and if you have time cover with cling film and leave for a few hours to marinate in a cool place. To cook this dish fry or stir fry in a big pan, it will take around 10-15 minutes to cook. If you have some rice cakes add these after about 10 minutes and mix well, if not don't worry it will still taste great. Once cooked put on a plate and serve. It is traditionally served on its own as it is very filling, however if you want it to go further you can serve with some rice. In pubs it would be served on a large plate in the middle of the table.